Scopoderm transdermal patches are applied to the skin to reduce the symptoms of travel sickness in those susceptible for up to 3 days. If your order is approved before 3pm, our UK registered pharmacy will dispatch your treatment the same day, for a next day delivery. How do I use Scopoderm patches? Scopoderm trans dermal patches are used to treat travel sickness in susceptible individuals. They contain an ingredient called hyoscine hydrobromide, sometimes known as scopolamine. These patches are placed behind the ear 5 to 6 hours before you are due to travel. Each patch lasts approximately 72 hours (3 days). Travel sickness is the feeling of nausea which is typically experienced when in a moving vehicle, such as a boat, car, or plane. Travel sickness, also known as motion sickness, occurs due to mixed signals in the brain. The vestibular system (inner ear), responsible for our sense of balance, and eyes send images to our brain to determine orientation and motion in order to stay balanced. If these signals conflict, they trigger a part of the brain called the chemoreceptor trigger zone (also called the vomit centre). When the sense of motion is felt but not seen, and vice versa, the brain releases chemicals which cause the symptoms. Diagnosis of travel sickness from a doctor is often not necessary. Merely experiencing the feeling of sickness, dizziness or vomiting during travel is enough for treatment to be sought. There are a number of natural ways you can reduce your travel sickness. Sitting in the front seat of a car and looking towards the horizon can reduce your chance of experiencing travel sickness. Take deep, slow breaths and focus on your breathing if you begin to feel nauseous. Take regular breaks when travelling by car to stretch your legs and get refreshments. When travelling by plane, you can reduce your symptoms by being seated at a seat situated by the window and over the wings, which are the most stable part of the aircraft. During take off and landing, try sucking on a boiled sweet to relieve the pressure put on your ears. Sea sickness is the name given to motion sickness which happens when on a boat. To avoid this, try to stay in the centre of the vessel as, much like in an aircraft, the centre of a boat experiences the least amount of movement. Staying by the window can be good idea, but avoid looking at the waves as rolling waves can contribute to sea sickness. If possible, stand on deck and look towards the horizon. Whether you are travelling by boat, plane or car, there are other ways of reducing your chances of experiencing motion sickness. Avoid using electronic devices, such as smartphones and tablets, while travelling as they can exacerbate symptoms. Reading while travelling should also be avoided by those sensitive to travel sickness. Listening to audio, such as music, podcasts or the radio, is preferable when travelling. Before travelling, avoid heavy, spicy or greasy food, and alcohol. It's often recommended trying ginger and peppermint when travelling. These are said to settle the stomach and prevent the feeling of nausea. Scopoderm patches contain an anticholinergic called hyoscine hydrobromide (Hyoscine). This compound binds to receptors in the brain, blocking the signals between the vestibular system (inner ear) and the chemoreceptor trigger zone (vomit centre). This means the conflicting information never reaches the brain, and so the vomit centre is not triggered. For the best results, apply a Scopoderm patch 5 to 6 hours before you are due to travel. One patch will offer relief for travel sickness for up to 3 days (72 hours). Apply a single Scopoderm patch to an area of clean, dry, unbroken and hairless skin behind the ear. Once you have applied the patch, avoid touching it as the medicine may seep out the edge of the patch. When you have finished travelling, remove the patch and discard of it safely. If you will be travelling for longer than 3 days, remove the already applied patch after 3 days and apply a new patch. Do not apply more than one patch at a time. Remember to wash your hands each time you apply or remove a Scopoderm patch. After removing a Scopoderm patch, wash the area the patch was applied to with warm water and mild soap. All medicines carry the risk of side effects, though not everyone will experience them. It is important to understand and be vigilant of any possible side effects your medicine may cause. If you experience any side effects, whether they are listed above or in the patient information leaflet, report them to your doctor. What should I do if I experience an allergic reaction caused by this medicine? If you experience the signs and symptoms of an allergic reaction, immediately stop using Scopoderm and seek appropriate medical attention. Does Scopoderm interact with other medicines? How can I stay safe while using Scopoderm patches? Do not drink alcohol while using Scopoderm patches. Do not drive or operate machinery as Scopoderm can cause dizziness, drowsiness and confusion. These side effects may persist for 24 hours or longer. Scopoderm patches contain aluminium. For this reason, they should be removed before undergoing MRI scans. Can Scopoderm patches be cut? No, Scopoderm patches should not be cut. If you only need to use the patch for a day, apply the patch as you normally would and remove it when you have finished travelling. How long do Scopoderm patches last? A single Scopoderm patch can provide relief from travel sickness for up to 3 days (72 hours). How does alcohol affect Scopoderm patches? Alcohol should be avoided while using Scopoderm patches. Drinking alcohol while wearing a Scopoderm patch can increase the chances of experience adverse effects, putting you at a greater risk of rare and dangerous side effects. After removing your patch, wait at least 24 hours before consuming alcohol. How do I throw away my Scopoderm patch? Gently peel away the patch and fold it in half so that the sticky side sticks to itself. Holding the non-sticky side of the patch, put the patch in the original pouch and put it in the bin out of the sight and reach of children and pets. You can also ask your pharmacist to discard of medicines you no longer use. How do I use Scopoderm patched? 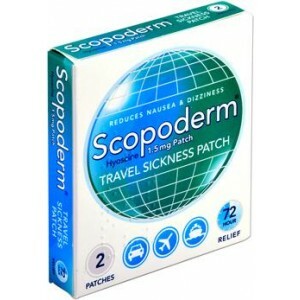 Description: Scopoderm are patches which prevent the symptoms of travel sickness. When Pregnant: Do not use Scopoderm while pregnant. Speak to your doctor for further advice. When Breastfeeding: Do not use Scopoderm while breastfeeding. Speak to your doctor for further advice. Prevents motion sickness from developing.